Sidney Crosby and Alexander Ovechkin are the hobby superstars of 2005-06 hockey products. However, the depth of the rookie crop continues to shine. Corey Perry might not have the hobby's attention as much as his Eastern Conference peers but he shouldn't be overlooked. Shop for Corey Perry cards on eBay. After scoring 50 goals, he was the winner of the Hart Trophy in 2010-11 as the league's MVP. Perry continues to find the back of the new regularly and has emerged as one of hockey's most dangerous snipers. He's also a proven winner. Playing with Crosby, he helped Canada win a gold medal at the 2005 World Junior Championships. Perry was part of two more gold medal-winning squads for Team Canada at the 2010 and 2014 Olympics. And the Stanley Cup? That was accomplished during his rookie season. Collectors have 17 Corey Perry rookie cards to track down. They're spread fairly equally between low- and high-end products. His most valuable rookie card comes from 2006-07 Upper Deck The Cup, which was the debut season for the Exquisite-esque super premium brand. Other popular signed cards come from SP Authentic and SPx. For unsigned cards, Upper Deck and Upper Deck Ice are the most popular. The Upper Deck card is a Young Guns short print, which adds much of its intrigue. 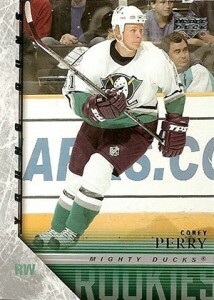 For Ice, it is limited to 99 copies, making it the rarest Corey Perry rookie card. For those looking to go back further, the London Knights made minor league Corey Perry cards as early as 2001-02. In the Game included him in a couple of sets leading up to his NHL debut including an autograph in 2004-05 Heroes and Prospects. Although there are lots of different Corey Perry autograph cards, there haven't been a lot in recent years. And most of those that have been produced have been done in limited numbers. They're not overly expensive but if his hobby stature rises, their relative rarity could increase demand.